A reward worth up to £1,000 has been offered to readers who help a city daily find the biggest pothole on its patch. The Glasgow Evening Times is challenging readers to find the city’s worst pothole as part of its ‘Spothole’ campaign. The spotter of the worst pothole worst pothole – based on size, location and length of time unattended – will receive a new set of tyres for their vehicle, worth up to £1,000. The Evening Times revealed earlier this month that Glasgow City Council received 602 pothole reports in the first week of 2018, compared to 162 in the same week last year. 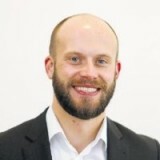 Evening Times deputy editor Henry Ainslie, pictured, said: “The state of Glasgow’s roads is atrocious, and as a voice for the city it’s important the Evening Times plays its part in shaming the council into action. “We’ve been amazed by the response, with readers sending in pictures and reports of potholes across the city through email, Facebook and on Twitter – using everything from rulers and newspapers to CDs and even their mobile phones to illustrate the depth and scale of the problem. “We’re not out to reinvent the wheel with this campaign, but we are showing our readers we’ll pick up issues that matter to them and push for action. Lucky to get a set of worn out retreads from our skinflint employers!